Our LOW PRESSURE, misting systems operate on normal household water pressures of 35 to 90 psi. Our pressurized misting systems generate their own water pressure so the number of nozzles they can support depends on the VOLUME of water they can move rather than water pressure. If you don't know your water pressure, you can contact your water provider or test it yourself with an inexpensive pressure guage available at most home improvement and hardware stores. 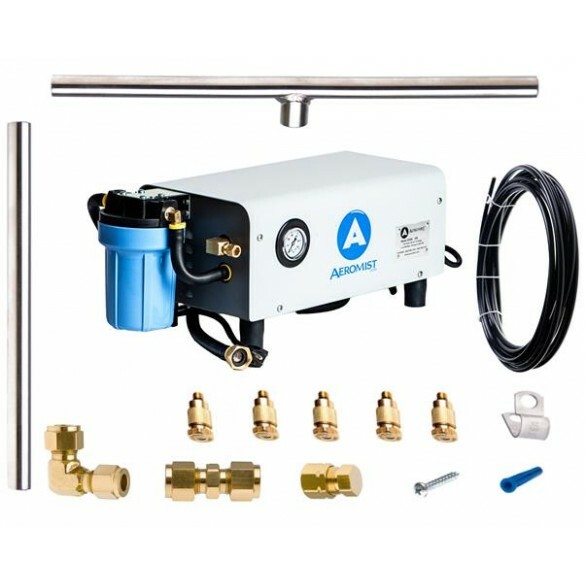 Two of our low pressure systems (the 3/8" Do-It-Yourself System and the 1/2" PVC Custom Misting System) are expandable using our 3/8" Misting Line 4 Nozzle Extension(s) or 1/2" PVC Misting Tees with Nozzles (5 Qty) respectively. You can expand each system to as many heads as your water pressure will support. 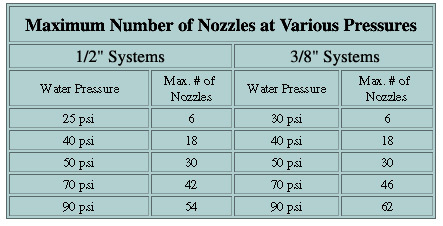 To expand these systems beyond the number of nozzles included in the base kit, you must make sure that your water pressure is sufficient by checking the chart provided here.